If bringing everyone together for a delicious Christmas dinner is part of your festive celebrations then make sure that you serve up the best tasting, quality, locally-sourced meat. 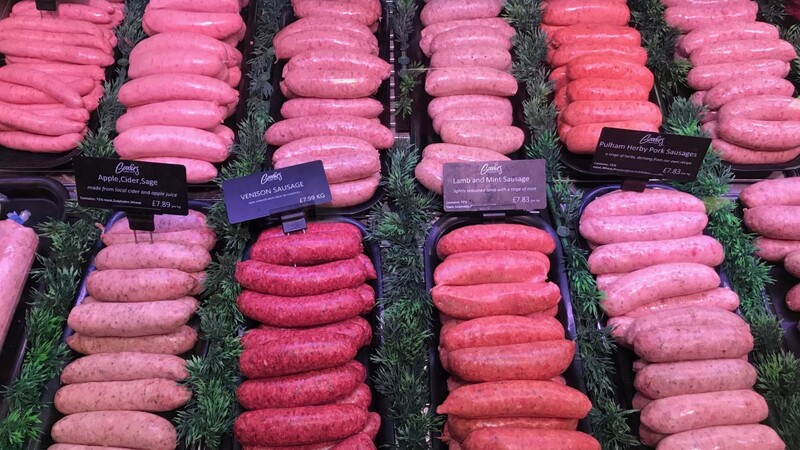 Order your Christmas and New Year meat now from Goodies and give them a meal to remember. Our renowned and respected Butchers can provide everything you need for a perfect Christmas or Boxing Day lunch, or New Year celebration. Download our Christmas and New Year order form here for details of everything you can order from Goodies. Choose from free-range turkeys, gammon, bacon and ham joints, beef, geese, chicken, lamb and venison, plus sausages and stuffing. Just complete the order form and return it to us, email foodhallgoodies@gmail.com (or drop it in to us if you prefer) and sort payment and we will do the rest. Then you simply have to collect your order on your collection day, take it home, cook, serve, enjoy and revel in all the compliments. Fancy a great value Afternoon Tea for Two? Did you know that we serve a great value Afternoon Tea for Two? Our Afternoon Tea for Two is priced at just £20.00. 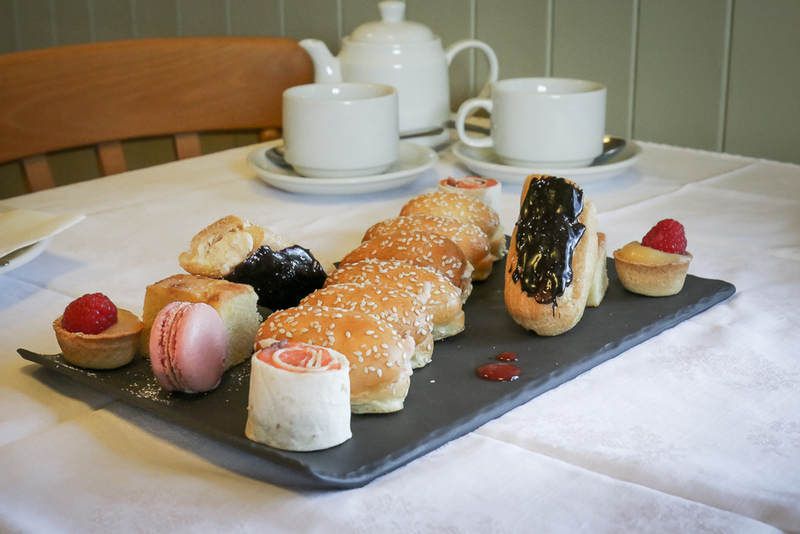 For this you will enjoy a pot of tea or coffee for two, two fruit scones with jam and cream, a selection of cakes (chocolate brownie, lemon drizzle, eclairs and lemon tart) and a selection of sandwiches (roast beef, cheese & pickle & prawn sandwiches and salmon roulade). It’s all absolutely delicious and a great way to treat someone you love or to catch up with a dear friend. Afternoon Teas are also a great way to celebrate a special occasion – like a baby shower, birthday or hen party. Our Afternoon Teas need to be booked 24 hours in advance so that we can prepare them fresh for you. We can accommodate most dietary requirements – please tell us at the time of booking. 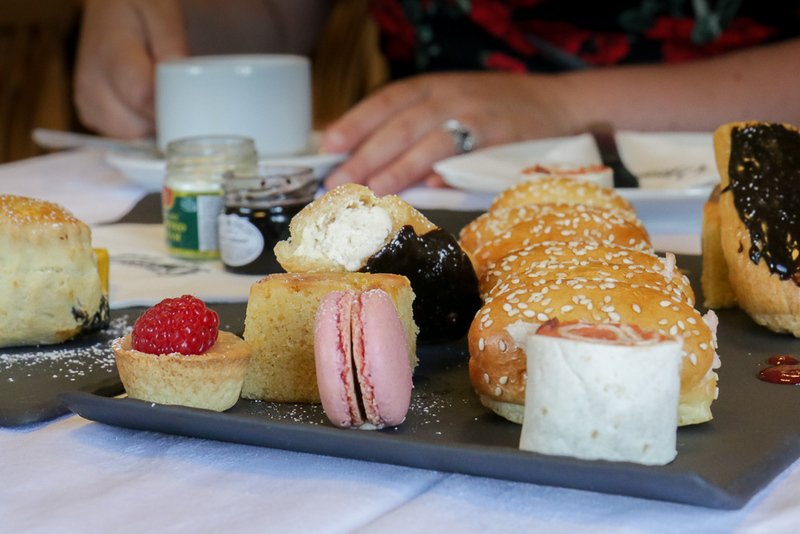 Our Afternoon Teas can be enjoyed any day of the week (including Saturdays and Sundays) with 24 hours notice and payment at the time of booking. In good weather they can be enjoyed in our lovely garden. To book your Afternoon Tea now please call 01379 676880. Got a friend who’s a Foodie? A loved one who deserves a real treat? A brilliant member of staff who needs rewarding? Or a great customer that you’d like to show your appreciation for? 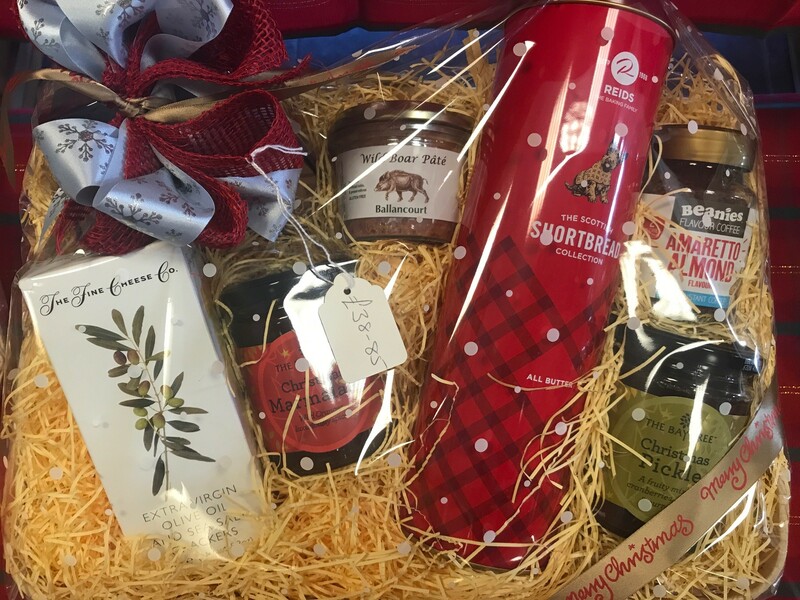 Our Goodies hampers always make an amazing gift, whatever the reason – and they are so much more thoughtful than a voucher too. 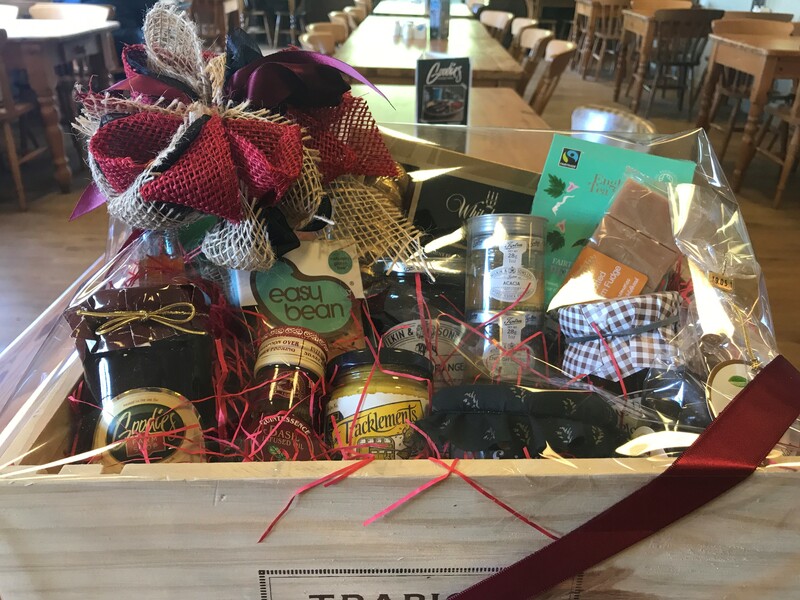 We can make hampers to any size and budget from big to small. We’ve even got some gorgeous giant wicker log-baskets ready to be filled too! 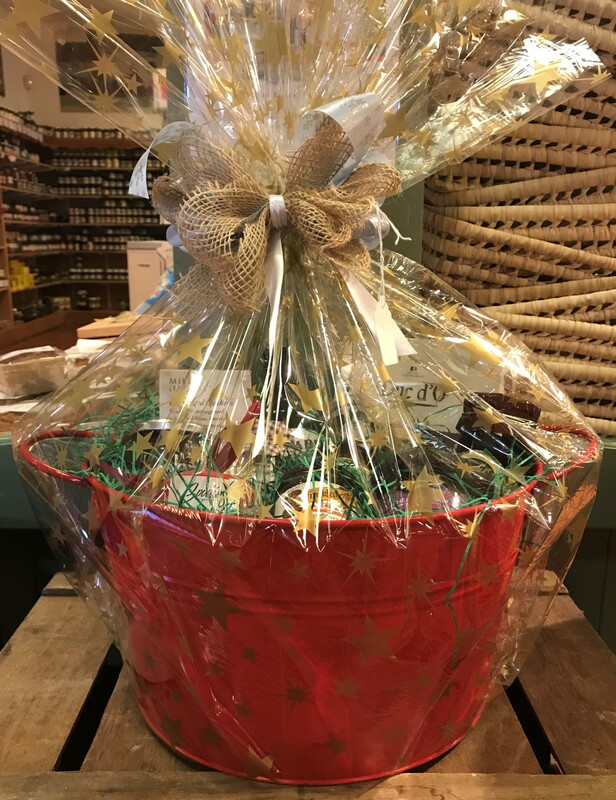 We’ve started taking orders for Christmas hampers now too, so pop in or give us a call if you’re considering giving a hamper this year. We’d be only too happy to help! 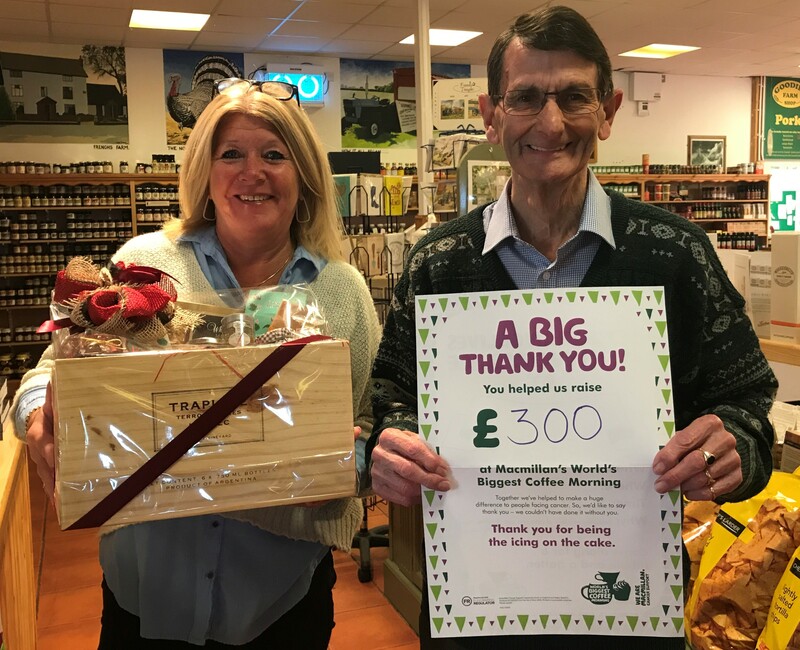 Stuart and Kim would like to say a big THANK YOU to all our lovely Goodies customers who joined us on Friday 29th September for our World’s Biggest Coffee Morning event and helped to raise a whopping £300 for Macmillan Cancer Support. We had some delicious cakes on offer (even if we do say so ourselves) and you were all so generous in your donations and in buying raffle tickets. We were delighted to award the prize of a bumper Goodies hamper to the winner Mr Middleton, who has experienced the excellent work that the charity do first hand and is a big supporter himself. Do you love cake and hate cancer? Join us at Goodies on Friday 29th September between 9am and 12noon to raise funds for Macmillan Cancer Support as part of the charity’s World’s Biggest Coffee Morning. There’ll be a delicious range of our amazing Goodies cakes on offer, baked by our Star Bakers, plus a raffle to win a fantastic Goodies hamper full of well… goodies! So why not bring your friends along and meet up to raise much needed funds for this brilliant charity. Children are very welcome and can join in the fun by taking part in our colouring-in competition, or have a run around in our lovely garden and play area. We hope to see you on Friday 29th September, from 9am to 12noon. Raffle tickets will be on sale all weekend. 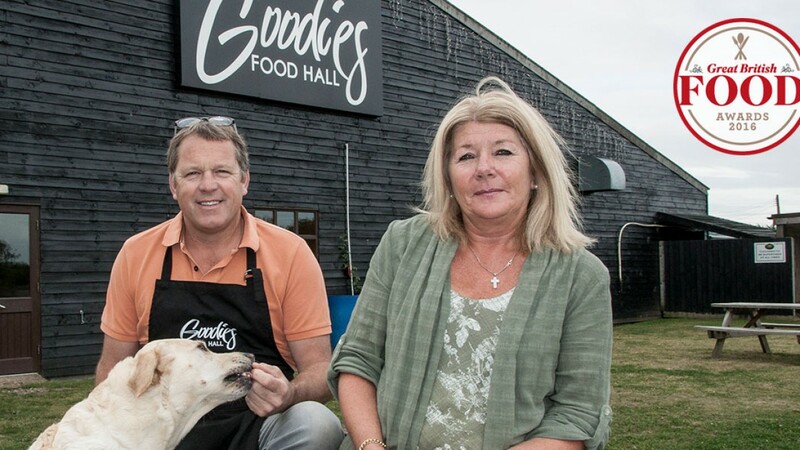 Goodies Food Hall wins an award. Top food industry figures, including John Torode, Valentine Warner and Nathan Outlaw revealed their favourite British products and retailers as part of the 2016 Great British Food Awards. Readers of Great British Food magazine were also invited to vote for their top picks in a number of food-related categories, including Best Cookery Book, Best Independent Retailer and Best Food Writer. Thanks to all of our customers, suppliers and staff for their continued support and loyalty without this none of this would have been possible.